Attitude and confidence – sometimes against all odds – have been the keys to the success of my guest this week. Steve Sims worked his way up from very humble beginnings to become an expert marketer in the luxury space and the founder of Blue Fish, a high-end personal concierge firm. Steve says there’s no such thing as failure – just lessons about what not to do next time and inspiration to move forward. Words any entrepreneur should live by. He’s also come up with a way to make just about anything happen – even a wedding at the Vatican – by kicking difficult projects off their “pedestal” so he can see the steps necessary to make it work. I’m excited to be talking with Steve Sims, a man whose name I’ll never forget because he shares mine. Steve describes himself as an ugly kid from the outskirts of London who wasn’t born into the world of luxury, but I can tell you he is certainly living in that world right now. He’s the founder of Bluefish. They’re one of the top personal concierge services and he is an expert marketer within the luxury industry. He’s been quoted in publications including the Wall Street Journal, Forbes, the London Sunday Times, South China Morning Post and a whole lot more. He’s been on TV, been a speaker all over the place including at the Pentagon and Harvard. He is the guy that you’re going to call if you want to go sing on stage with your favorite rock star. If you want to be serenaded by Andrea Bocelli, if you want to walk the red carpet with A-list Oscar parties. The stories are incredible. The things that he has pulled off for his clients. I’m excited to have Steve Sims here. 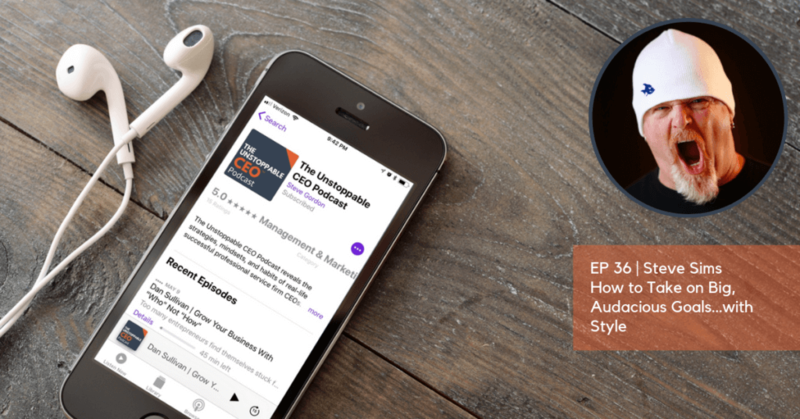 Steve, welcome to the Unstoppable CEO Podcast. It’s a pleasure to be here. Thank you very much for the buildup. It is quite amazing the things that you’re able to accomplish. One of the reasons that I’m excited for you to be here is you epitomize this idea of unstoppability. You’re famous for not taking no for an answer. Before we dive into things, maybe you can give folks a little bit more background, a little bit of context. How you got started and how you built up Bluefish and got to this point. I was a bricklayer from outside of London. I knew that I never wanted to do it. My whole family was in the construction industry, including my mom. I knew I didn’t want to do that. Friends of mine in the ‘80s were getting into the banking, insurance and all this stuff. I managed somehow to talk my way into getting an internship as they exported 200 people from England over to Hong Kong with a bank. I got caught up in that crowd. I landed on a Saturday, partied with the guys on a Saturday, partied with them on Sunday, went to orientation on Monday and I was fired on Tuesday. They realized that this cocky little Irish boy from London had blagged his way into this job at the ripe old age of nineteen and didn’t know what he was doing. They fired me. I started working on the door in nightclubs in Hong Kong because I am 230-pound of ugly. It was what God obviously built me for. I never saw it as a failure. I thought, “I’ve got this far. What’s next?” I thought, “If I communicate with the affluent people,” because, let’s be blunt, poor people don’t buy stuff, affluent people buy stuff. If I start building up a network of affluent people within Hong Kong, I could get a job with them. On the door I used to just turn people away going, “Not tonight. I walk down the road, speak to Johnny, tell him Sims sent you, he’ll look after you,” and then I started throwing my own parties. I started taking over yachts and throwing events on there. Then people would say, “I’m going to Monaco.” Someone said to me once, “I’m going to the Monaco Grand Prix, can you help me out?” I went, “No problem.” This was in the ‘90s. I went back to my apartment. I phoned up some people to try and find out where Monaco was. To say that I was a world traveler, I’d never left England. My first time out of England, I was in Hong Kong. Everything was new and shiny to me. It was one of those things I had nothing to lose. I was also ignorant to how uneducated I was so nothing scared me too much. I’d be like, “Yes, okay. Good.” I went on with that thing. As I started doing stuff and I would approach people and go, “I need this. I need it tonight. I need it for four people at 8:00. Do you want them to be there 7:55 or do you want them to be there 8:15?” The way I approached people, people would be like, “Yes. 8:15 is fine.” “Great. They’d be here.” “Put their name down, Sims.” I would come in like a bull in a China shop and I started to build up these things. The funny thing is, the more things you do the more things you’re able to do. It starts off by getting people into good clubs, then it starts getting them into good locations, then it starts getting them into A-list parties. The A-listers start employing you to do things for them and plan their travel. Get them Ferraris, get them exclusive watches, get them new releases on things. Then all of a sudden, it transformed into the bucket list of, “I want to go and see the Titanic. I want to get married in the Vatican. I want to ride pillion on a MotoGP bike.” Again, every time you do something, it gives you the credibility to do something bigger and bolder the next time. That’s in a nutshell, bricklayer to walking the white carpet with Elton John every year. Every time you do something, it gives you the credibility to do something bigger and bolder the next time. It’s an impressive story but the most important thing you said was when you lost that job on day one, you didn’t look at that as a failure. You just said, “I made it this far. What’s next?” Not everybody takes that approach to it. That’s a pretty unique way to look at things. It sounds like that’s been a theme for you. The people in our audience right now are business owners generally, pretty successful business owners. They’ve been slogging through it for five years, ten years, and twenty years. I call that group Unstoppable because they’ve been through some stuff. They’ve got the battle scars to prove it. What are some of the things that have helped you push through as you’ve run into those roadblocks? Some things that you can share with everyone that’ll inspire them and help them move forward. It’s interesting when I’m around business owners, entrepreneurs. The conversations that I had are completely different than when I happened to be around people who still have a job. For the entrepreneurs, we’re always on the edge. We’re always one step away from the next disaster, the next shoe falling. Living with that, it makes you think a little bit differently. I think little bit broader about like, “Where are my exits? If stuff doesn’t quite go right in this one, what’s the next step? How am I going to fix that? How am I going to overcome it?” Steve, you’ve done some incredible things. As I was looking down the list of the things that you have pulled off, I’m sitting there thinking, “He’s seeing things on a different plane.” It seems to me that you see opportunities to make something happen or at least you got the energy to push through every obstacle that there is. Maybe that’s the secret. To have that vision of somebody calls up and goes, “I want to have my wedding in the Vatican.” Where do you even begin to start to pull that off? The first thing to do is get it off that pedestal. Many people that come up with the same question as yourself and they go, “You did this with Sting? You did this with the Pope? How did you reach it?” They are pushing the ability for it to happen further away because they’re putting it on this pedestal and they’re putting blocks on top of that pedestal. Put it this way. You want to get married in the Vatican. That’s a brilliant big picture and it’s also an incredible thing, but let’s backtrack it a little second. A wedding, if someone said, “Put a wedding on.” You know you’ve got to get a wedding license, you know there’s got to be caterers and you know there’s got to be photographers. You can dissect what a wedding is. Forget the location. Vatican, take the word Vatican out of it and call it a church or a venue. All of a sudden you de-pedestal it. Stop getting scared of it and bring it back to what it is. You see a superstar that’s talented, great. That superstar is also a human being with blood and sweat and probably gets a ton of people crawling up his backside every time. He is already guarded. You put them on a pedestal, you’ll push them further away. The Vatican is another one of those examples. I’ve gotten really good at not answering a question where you can answer no, unless no is the answer I want you to give. We had a client that wanted to have dinner in Florence and his only request to me was it’s got to be an exclusive restaurant. We took over the Accademia in Florence which houses Michelangelo’s David, set a table of six up and had Andrea Bocelli come in and serenade them halfway through dinner. When I went to those people, I did the exact same thing. What steps do we need to do? Halfway through my conversation then I said to them, “I’ve got to ask, have you done this before?” They were like, “No, we haven’t.” That’s when you can jump on that no to get on that pedestal and go, “Fantastic, isn’t this great that we’re doing something that’s never been done before? Can you feel that?” That’s when the no becomes a fuel to make it go forward. Getting them into the passion, getting them into the challenge, getting them into the remarkable aspect of what they’re doing now is a change, a difference. It has never been done before. People like to do stuff that’s never been done before. They just don’t like you coming in and buying it or pushing it and they want to be the ones to make the decision. I’ve gotten really good at not answering a question where you can answer no, unless no is the answer I want you to give. One of the things that we try and focus on is making things incredibly practical for people. It’s easy for somebody to come on and have this grand theory of how things work. With what you shared there, that’s a million dollar thought that just about anybody can take. You know what I look like. You know who I am. I’ll go toe-to-toe with anyone when they go, “You had parents with money. You came from Harvard and stuff.” I remember when I spoke at Harvard. I was sweating. I’m sitting in this auditorium with everyone staring at me and I’m thinking, “I didn’t go to college. I left school when I was fifteen years old.” I had a little bit of a hang-up about it until I realized, “Hang on. This gave me the edge because I know what it’s like to fall down and to get up.” I think that any of these people out there that maybe have something where someone else can outshine them, you may be surprised that your inefficiency is actually your edge in winning that battle. This works on so many different levels with people’s mindsets. In our work with clients and in our main business, we work with professionals. People who are pretty highly educated. They spent a lot of time in school, sometimes four, five, eight, ten years in school and then multiple years of training after that. When they come out in business and they realize, “We didn’t learn actually how to go sell anything or run a business,” they end up finding us and we work with them. A lot of times the first thing that they’ve got to overcome is the sense that, “I don’t yet know enough. I can’t go out and do this.” It’s amazing to me to see that happen in people who have gone through so many different things. Yet, when we work with clients who have bootstrapped themselves up, it’s almost always the opposite. These are little mind tricks we play with ourselves are the biggest challenges to overcome. I appreciate you sharing that. Steve, we’ve had a ton of great interviews. This is one of my favorites. Some of the simple things that you have shared with folks, if they take these one or two little things and go do them, they’re going to improve the results that they’re getting both in their business and in life in general. I know you’ve got some things happening right now in your world. You’ve got a book that is out as people read this and probably a ton going on with Bluefish. What are you most excited about right now? Life. I’m always excited. I wake up in the morning. I never know what I’m going to be doing now, tomorrow. I’m quite an excitable little fellow. There is a lot going on. I’ve got Bluefish, which is obviously the high-end concierge. We’ve released a new one called Taste Of Blue, which is a taste of Bluefish for those people that don’t need the bespoke treatment. As you mentioned, in about ten years of different formats, finally Simon Schuster have published a book for me. It got to the stage where I wanted to produce a book that gave you easy steps. There are a lot of books out there that give you the a-ha moment and you’ve got to do this and you’ve got to tweet five times. As a blunt instrument, this worked his way up in working out what works and what doesn’t. I wanted to put a book together that taught you how to communicate, how to react to a communication and build relationships. I’m a great believer in Bitcoin relationship to the greatest currency in the world. Through relationships you can get anything. I want to teach people how to fire their vampires, audit that circle to get rid of those that are negative, and how to discover that negative and maybe how to identify a brand and a structure that is easy to use and stop putting these shields up which take effort. It’s a how-to for dummies to live your life easier for you to achieve relationships, connections, networks. I talk about in there everything about how to reach a celebrity to how to brand a florist. It is a dynamic cross board of my simple how-to steps and at the back of every chapter, it even gives you a playlist on, “I did this at the Vatican, I followed these twelve steps,” but you can follow those steps if you want to nurture a relationship with a significant other. Maybe there are other that you haven’t discovered yet? Position yourself to find that other. The bits and pieces that you’ve shared are incredibly practical and that’s one of the things that I’m looking forward to with it. You said something important there. This is a mistake that a lot of people make. The first natural question when you’re trying to accomplish anything, whether it is, “I want to go and make my spouse feel great now,” or “I’m trying to do this major business deal.” The first natural question is, “How do I do that?” I think the better question is, “Who do I need to talk to to get closer to it?” When you can identify that, it makes everything much easier. I appreciate you highlighting that in the book. What are some of the things people could take away if they’re looking at making the shift and focusing on relationships, what are a few little tips that they can take away that will improve what they’re doing with the people in their network? The first thing they’ve got to do is they got to sap out those that are no good in their network. You’ve got to basically turn around and go, “Is there anyone that I talk to, whether it be my accountant, my printer, my plumber, my girlfriend, my CEO, CFO, is there anyone in this circle that gets me negative? That gets me aggravated?” Because without you realizing it, that person will annoy you. Your persona changes, your effort level changes to comply, or to work with them or to mold. “I don’t want to get rid of that person. They’re a good earner, but they annoy me.” What happens is you then go to your next person carrying over some of that negativity and it is a cancer. I can’t dilute that. I can’t make that strong enough. It’s a cancer because the next person’s going, “Steve seems a bit off now,” and you don’t want people that you like thinking that. If they thinking two or three times, they start recalling, they start pulling back and that cancer grows, you lose a good person because of the bad person. If you get rid of the bad people at your life, fire the vampires, as I call it in my book, you’ll only engage with people that keep you positive. It may sound hard, but I have fired literally my printers, my accountants, really good earners in the staff and people have gone, “This was one of your best earners.” “Yes, but they bothered me.” When I was bothered, I then talk to my favorite clients angry, demotivated. You fire them. Your finances may change for about a month, but it creeps up. Your level of enjoyment creeps up and every time you’re speaking to someone, you want to converse with them. When you want to do something, funny enough, there’s no effort in it. That’s the biggest thing. Get into your inner circle, find out those that negate you and quite simply be harsh, cut them out because they are cancer. Don’t look at them as anything more than that. They will screw up every other part of what you’re involved in. It’s not the first time I’ve heard that advice. Others have said similar things and I know that for somebody sitting on the other end of this conversation and eavesdropping on us, the first thing they’re going to go, “That makes a whole lot of sense,” and the next thing they’re going to go is, “That’s really hard. How do I do that?” I know the answer, but I’d love to hear from you what’s the easy way to do it, but I don’t think there’s an easy way to do it. I think the answer is just do it. Is that the approach? Yes. It does make me giggle a little bit and it’s all down to perspective. You’re a business owner. You’re looking after a community of clients, teams, staff, your husband, your wife. You’re looking after a community and now you’re going to get all soft and soppy because you’re cutting out cancer? You’ve really got to look at it what it actually is. This is something that’s affecting your productivity, your positive energy. Look at it as the dangerous, horrible thing that it is and get in there with a Band-Aid. No one cuts cancer out carefully or delicately or cares a damn about the cancer it’s pulling out. You’ve really got to get that in your head that what you’re getting rid of is something very horrible and disastrous. No one cuts cancer out carefully or delicately or cares a damn about the cancer it’s pulling out. You’re getting rid of is something disastrous. It’s got to be done quick. You’ve got to go up there and go, “Jennifer, thank you very much for your years but it’s not working here and I’ve got to focus on the community that we got here. I’ll give you your two weeks. I wish you all the best. I’ll give you a reference but you need to go somewhere else because there’s a fit for you somewhere else, not here.” You’ve got to go in there and you’ve got to pull that thing off like a Band-Aid. You’ve always got to go in there remembering the community that you’re protecting. You wouldn’t stick your family next to a new killer waste dump. You wouldn’t do it. I don’t understand why you wouldn’t look at the negativity in your life as exactly the same. I’m glad you mentioned the clients. That can sometimes be people’s biggest scare. They look at it and they go, “That’s a client.” It’s like having a bull as a pet in your house. You wouldn’t do it. You’ve got to change your perspective that this person, whether they’re paying you money or taking money from you, they are sapping stuff away from you and making you less of you. You’ve got to prune the clients. In fact, probably if anything, clients may be the first people you’ve got to look at. There’s that challenge of, “I’m going to lose some money here,” but I’ll tell you what we’ve found over the years. As we’ve prove them, it creates so much space for really great clients to come in. The interesting thing we’ve observed is when you make it known to the other clients that you’ve let some go, the ones that stay, the ones that passed muster and are still there, they now have a different relationship with you. They don’t want to get fired and they now will behave and be really great clients. It’s not that you’re trying to belittle or position yourself above. For them to get value and for you to deliver that value over the long-term, you’ve got to have this relationship where everybody’s winning all the time and feeling good about the way that it happens. It helps foster that by letting them know that not everybody gets to stick around forever. You’re building up value. You’re telling people that you’re not there to be trampled on. You’re also quite simply establishing by showing it clearly that you value them so much as clients, you harvest the bad ones out. You clean up. I want to let people know where they can go find more from you and find the book most importantly. That’ll have an immediate impact on them. Where’s the best place for them to go? I’ve got a website called SteveDSims.com. That’s got all the links on there. Where you can grab the book? You just head over to Amazon, Barnes & Noble, Books-A-Million. It’s called Bluefishing: The Art of Making Things Happen. TheBlueFish.com is our concierge and TasteOfBlue.com is for those people that don’t need a bespoke suit, but do want more interesting cocktail stories. Steve, thanks so much for being here. This has been a lot of fun and it had been a real pleasure to talk with you. I appreciate it. Thanks for your time and energy.